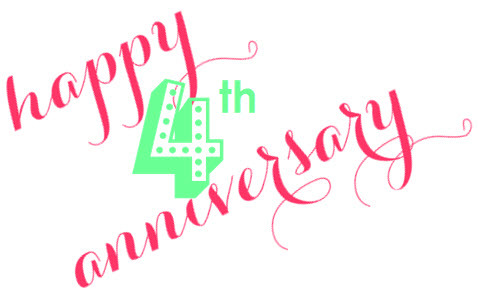 Saturday was a special day on this blog as it marked 4 years of blogging. A BIG thank you to all my loyal readers who inspire me everyday! I still find it amazing that something I started for fun has turned into so much more. It has given me so much happiness, joy and the motivation to go back to school so I can follow my dreams. PS-To mark my 4th anniversary I gave my blog a little makeover, hope you like the new look around here! Happy anniversary ... the new look is so clean, fresh, pretty! Congrats on 4 years of fun ad the new design looks great! Happy Anniversary ...a huge accomplishment in our blog world! Congrats on 4 years! Such an inspiration! Congrats on 4 years!! Huge milestone-- love your blog. Happy Blogiversary!!! Loving the new look! woohoo - happy blogging doll! Congrats! That's a pretty great accomplishment! Congrats! To many, many more years. Happy Anniversary! I think I've been reading for over 3 of those 4 years! Yay!!! Congrats on 4 years! I hope you ate some cupcakes and celebrated!!! It looks great, and you don't look a day over 3! Happy anniversary. wow, lovin the new look! happy 4th bday! I'm only 8 months. hope to be in your shoes one day! Congrats to you on keeping things fresh and cheery here. Four years, now that deserves some celebrating! Happy Anniversary! Looking good around here!